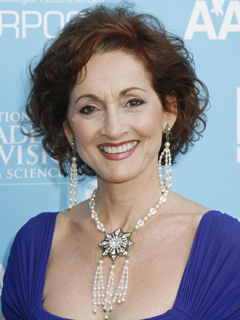 Soap viewers were first introduced to the dazzling Robin Strasser when she created the vixen Rachel Davis on ANOTHER WORLD in 1967. Since then, the lively and sometimes controversial actress has become a virtual fixture in daytime. Strasser's interest in performing was palpable at an early age. Born and raised in New York City, she graduated from the prestigious High School of Performing Arts. She then attended Yale School of Drama on a full scholarship. Upon graduation, Strasser began her foray in daytime TV and performed in plays, including The Shadow Box and Chapter Two. Her AW character was so popular that she appeared in the short-lived spin-off, SOMERSET, in 1970. After leaving AW in 1972, Strasser continued to do theater, as well as movies, TV movies and prime-time guest spots. She returned to soaps in 1976 when she took on the role of ALL MY CHILDREN's Dr. Christina Karras from 1976-79. The actress then began her longest daytime stint as ONE LIFE TO LIVE's Dorian, which she played from 1979-87, 1993-2000 and again from 2003-present. During her first hiatus from Llanview, Strasser continued to make a name for herself in prime-time, playing KNOTS LANDING's Dianne and starring in several movies of the week. When she left OLTL in 2000, however, her exit was more controversial; she felt as if she was forced out when her contract negotiations came to a head. Still, Strasser managed to bounce back and signed on as PASSIONS's 300-year-old witch, Hecuba, that same year. She also spent time in France and continued to work in theater and TV. Since returning to OLTL in February 2003, Strasser has enjoyed several front-burner storylines, including Dorian's marriage to evil Mitch, a hot romance with con artist David and her character's continued rivalry with Viki as the ladies battle over Clint. Somehow, the busy Strasser still found time to star in a production of the play The Tale of the Allergist's Wife in 2004 and also began producing videos on women's health issues in 2005. When she's not working, Strasser does fund-raising for AIDS, is on the Advisory Board of the American Menopause Foundation and is a spokesperson for the National Osteoporosis Foundation. In her spare time, she loves yoga, cooking, collecting antiques and doting on her dogs: a Maltese, Bisou, and a mixed breed, Roc-qui. Her middle name is Victory In Europe, shortened to Vee. It's in honor of her being born on the day when Germany surrendered World War II. Both she and her character suffer from claustrophobia. Organized and produced the CD One Life, Many Voices, which featured her OLTL co-stars singing the tracks. Profits from it helped aid Hurricane Katrina victims. ROBIN STRASSER ON PP: "OK –I'LL STEP IN IT"
Robin Strasser (Dorian, OLTL) took to Twitter to discuss her feelings about OLTL getting shelved — and the unpaid salary she is reportedly owed from Prospect Park. Test Your Soap Smarts About OLTL's Dorian! Think you know everything there is to know about OLTL's Dorian? On her hotline, OLTL's Robin Strasser (Dorian) addressed the show's early hiatus. The Prospect Park casting news keeps coming! Robin Strasser has announced via Twitter that she'll be reprising her beloved role as Dorian Lord for PP's online version of ONE LIFE TO LIVE.